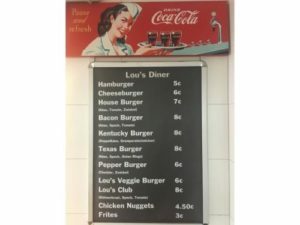 Speak to any passionate foodie, and they will tell you that one of the best hidden gems for American fast food is Lou’s Diner in Beidweiler. 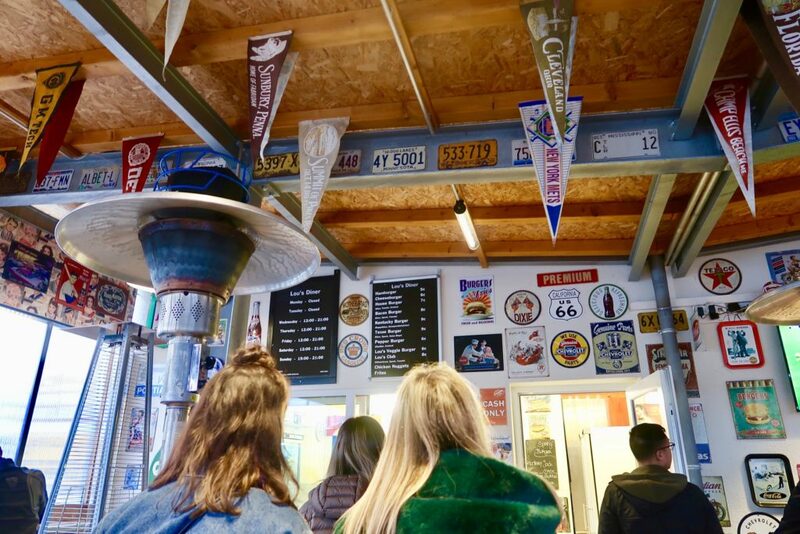 I’d heard so much about this place from “it’s in the middle of a field” to “there’s no roof it’s freezing” but “it’s the best burger you’ll ever eat”. I had to witness this for myself, but the opening hours used to be very inconvenient (they opened at 15:00), but they’ve changed their opening times so now I really had no good excuse. Not bad right? The fact that their kitchen opens all afternoon means this is the perfect place to stop off when you’re feeling peckish or you have visiting guests who have missed the generic 12-2 mealtime. First of all, it isn’t in the middle of a field anymore, it’s in the suburbs but it’s a residential area and there is a car park for customers. 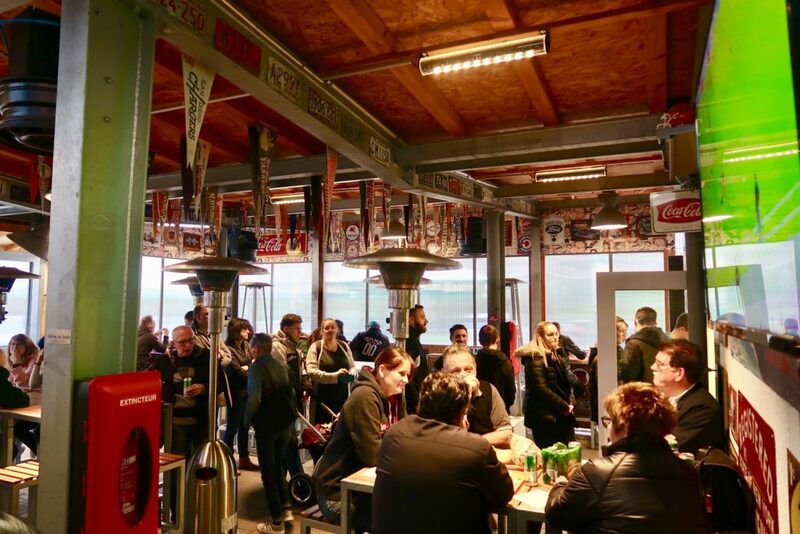 You’ll notice the red flags marked with “Lou’s Diner” and then you will see a great outdoor area which I can imagine gets pretty crowded in the summer. Now the inside does give you that “hole in the wall” vibe which foodies love but this place is so well equipped that it’s definitely a cozy night out. 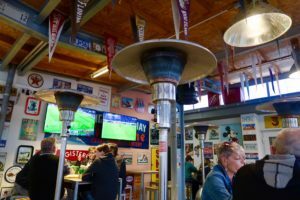 There are heaters, tv screens showing sports and clean toilets. They’ve decked out this place big time and while it maintains a shabby chic style, it’s definitely no longer a shabby setup. Old school posters and advertising boards fill the room, music is playing and the screens are showing sports. 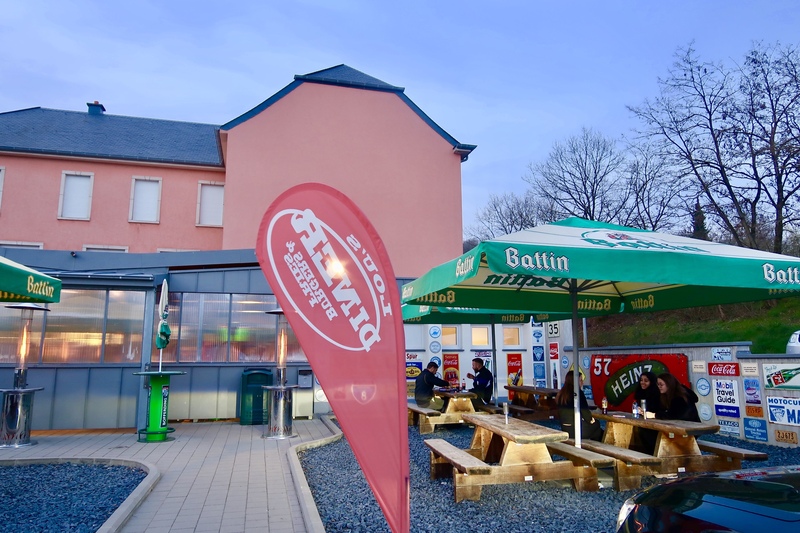 There’s definitely a solid roof over your head and the heaters will keep you nice and toasty no matter the weather. They’ve upped the game, and we’re appreciating it. This is predominantly a burger place and as you may know, I don’t eat beef so my next best option was the Chicken Club and the Chicken Nuggets, don’t worry, I had both. There are no vegetarian options (unless you count fries), it would be great to see some sort of vegetarian options so veggies can dine here too with their meat-loving friends. 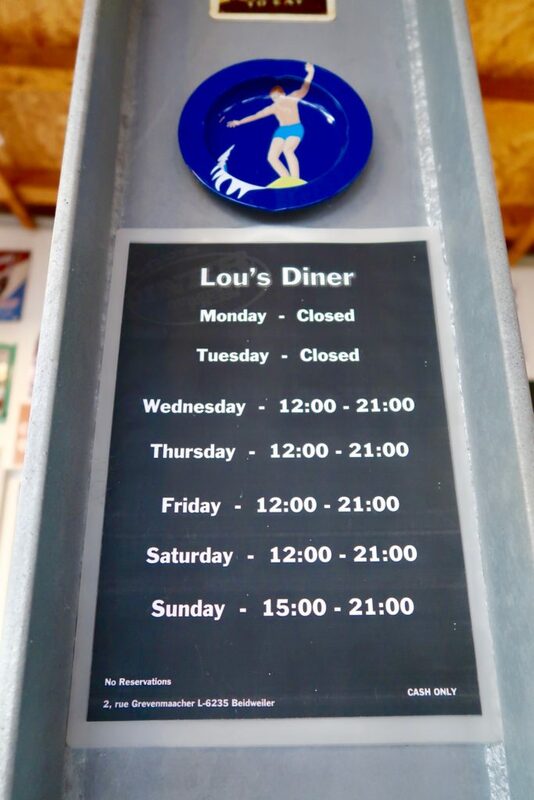 It’s worth noting that from 15:00-21:00 on Thursdays, they serve Pulled Pork and Tennessee Fried Chicken. They also mention that their must-try is a Taco Dog but I’ve yet to see that on their menu, perhaps it is sometimes there as a daily special. If you’re a sauce fiend like me, you will find the list of sauces very enticing. From the simple chilli mayo and andalouse to baconnaise, you’ve got plenty to choose from. 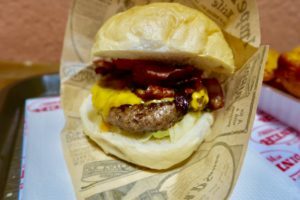 The burger got the nod from the meat-loving husband that it is, in fact, the best burger that he has tried in Luxembourg. The buns are homemade, they are this very light and airy buns which don’t have the heaviness of a brioche bun and certainly look nothing like the shiny factory made ones most restaurants serve you. 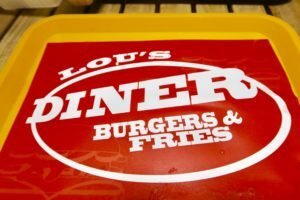 From the homemade bun to the homemade sauces, you can really see that the people behind Lou’s Diner really care about food. 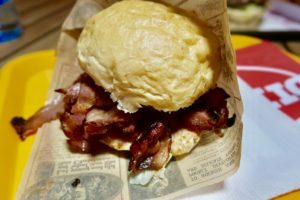 I had the Chicken Club which was layered with their house dressing, tomato, lettuce, bacon, chicken and finished off with their homemade bun. It was delicious. I couldn’t leave without trying the nuggets and this is the moment I was knocked off my seat….the chicken in their nuggets are made of REAL chicken. Not some kind of processed fast food “chicken” but real pieces of flavourful chicken. 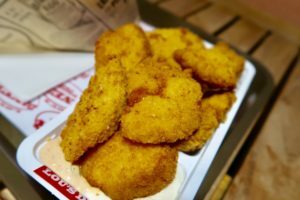 I ordered the jalapeno mayo and bacon mayo, both were great but the jalapeno in particular complimented the nuggets perfectly. The chips they serve are giant chunky chips, I prefer skinny fries so didn’t order them so no comment on the fries (yet!). 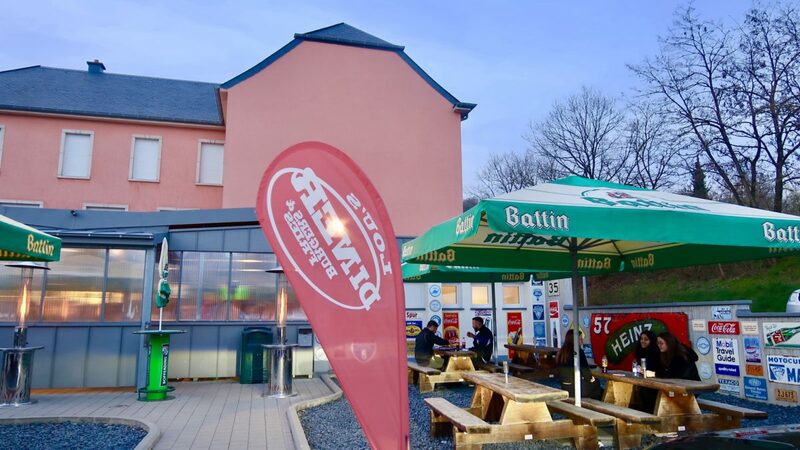 All in all, this is one of the coolest places to eat in Luxembourg in my opinion. It’s casual, it’s all about the food and it’s fuss-free and unexpected. If you searching purely for a really satisfying American meal, this is the place to go. 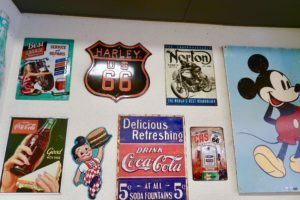 I’m really hoping that with the new decor will eventually come a larger menu but honestly, even if they just keep serving burgers and nuggets, I’ll keep on visiting. This is the kind of place you grab a quick and easy meal that really satisfies a craving. Don’t dress up for it, just go really really hungry!